What Are The Primary Causes Of Hallux Valgus? A bunion (from the Latin 'bunion', meaning enlargement) is a protuberance of bone around the big toe joint. 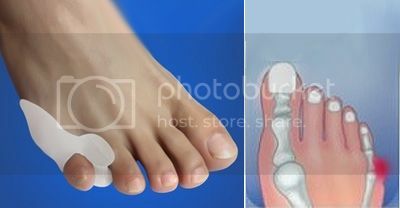 The enlargement can also occur at the outside of the foot, at the base of the little toe. This is called a tailor's bunion or bunionette. As a bunion deformity progresses with time, an enlargement increases in size behind the big toe, making shoe wear difficult and painful. Consequently, the big toe will shift position and move over or under the toes next to the big toe. Bunions can occur at any age between childhood and the golden years. The occurrence of bunions are far more prominent in women than men. Ill fitting narrow shoes and shoes with heels tend to aggravate bunions and cause them to occur at a higher incidence.